Sign into the Payfirma Tablet POS. Tap the menu icon on the left side of the screen. From here you can see your full transaction history and even dig deeper to see sales details on each individual transaction by tapping on a transaction record. 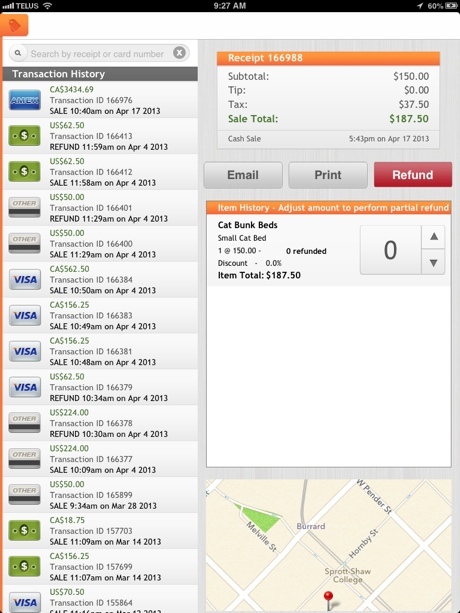 When you select a transaction, you’ll see a sales recap including taxes, tips, item description and time of sale. From here you can re-send an email receipt to your customer or issue a refund. You can also view your transactions using the PayHQ web platform. Sign in to your Payfirma account online hq.payfirma.com and select ‘My Transactions’ from the home screen.